The flying car has become a cliche in how a technology promise was not kept. Flying cars were quite a common prop in movies in the 1950’s and 60’s with the implicit promise that they were around the corner. And if you are the kind that follows tech news obsessively and have a great memory, you will remember the startup from MIT engineers that has been building flying cars since 2009. The Transition, a road-ready prop plane with retractable wings, received approval from the US National Highway Traffic Safety Administration in 2012 that essentially made it street legal. And the startup even managed to sell a handful at a price of $279,000 each. Now Volvo’s parent company has bought this startup. So go figure. But it is safe to say that we overestimated, wildly that too, as to when we would be able to zoom up and above a road jam. This happened because we underestimated the technical challenges and in this case, the policy challenges played spoilsport too. The very thought of millions of cars moving up and down would have any city planner screaming. Now to come to something more prosaic – a video phone. This was the dream of the likes of AT&T. This would seem to be a killer app that nurtures the basic human instinct for connection through voice and sight. But it did not come to pass despite an early service from AT&T (called “Picturephone”) from the 1960’s. This itself was the product of long years of research at Bell Laboratories, as detailed in the May/June 1969 issue of Bell Laboratories’ journal. A lot of the research that went into making videophones real however went on to benefit broadcast media, aka, television. For example, AT&T did not want to lay out any new infrastructure for supporting video calls. Therefore, the researchers had to develop efficient video compression technology for cramming all the bits of a video call into the AT&T wires and this turned out to be very useful for television transmission. This is one of many examples where technology development for some target product goes on to spur development of other, unrelated products. 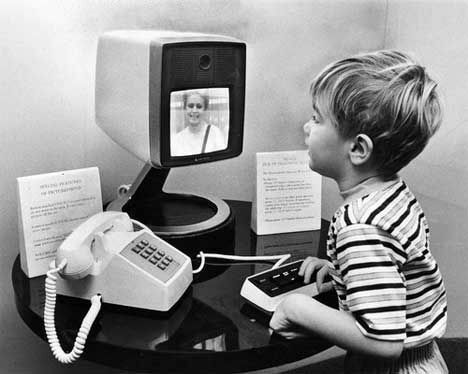 So while the videophone in its heyday (1973) had only about 100 subscribers in the whole United States, television had already become a runaway success, with 60 million sets in use in 1960. So what happened to the videophone is that it never took off as a standalone appliance, but it snuck in through the backdoor – through televisions and then through our computing devices. The rise in internet connectivity and high-bandwidth wireless connectivity, led to the proliferation of video telephony but not using the phone line but using IP connectivity. Telemedicine is something that I remember reading of in the early days of 2000’s as an area that had the rare distinction of being both technologically challenging and therefore cool and relevant to humanity, even outside of the ivory towers that we tend to live in. So it could be used to deliver healthcare to remote or poor regions or any region which for whatever reason could not have doctors with the right expertise physically present. I was surprised to read that this vision is almost a century old. And no, it has not taken off to any significant extent. More of my surmises on why not are below. The 1925 issue of the Science and Invention magazine promised a hopeful future. The Teledactyl (Tele, far; Dactyl, finger — from the Greek) is a future instrument by which it will be possible for us to “feel at a distance.” This idea is not at all impossible, for the instrument can be built today with means available right now. It is simply the well known telautograph, translated into radio terms, with additional refinements. The doctor of the future, by means of this instrument, will be able to feel his patient, as it were, at a distance….The doctor manipulates his controls, which are then manipulated at the patient’s room in exactly the same manner. The doctor sees what is going on in the patient’s room by means of a television screen. This instrument was also supposed to have haptic feedback so that the doctor could feel what the robotic arm was feeling at the patient. On the face of it, this seemed to be a logical progression from how communication technology has progressed. We learned to talk to people over distances using the telephone, then got used to listening to performances over the radio, and then we learned to love to watch shows over the television. So we should now allow the busy doctor to not have to make house calls, and even the busy patients from not having to visit the doctor’s chambers. We can make all of this history through the Teledactyl, or some such device. This did not come to be, though I am hopeful that it will have its day in the sun in the future. Why the slow uptake? I think the reasons are partly technological, partly human psychology, and partly regulation. Technology-wise, the regions lacking the quality doctors also happen to lack the communications infrastructure needed to support the instantaneous high bandwidth interactions for remote medical operations. So the commercial incentives were not there to lay out high bandwidth connectivity and the governments of the countries needing the technology most did not make the required investments either. Human psyche wise, we have never gotten comfortable with the idea of robotic devices poking and prodding us. Heck, it is a big struggle to design robots to even co-exist in the same physical spaces as us humans. Finally, the medical field is a sloth when it comes to regulations and much of it for good reason. When there is speculative technology added to the mix, regulation moves like a particularly slow-paced sloth. Only in May 2017 did the last holdout state, Texas, finally allow a doctor to interact with a patient remotely without first having seen the patient in person. 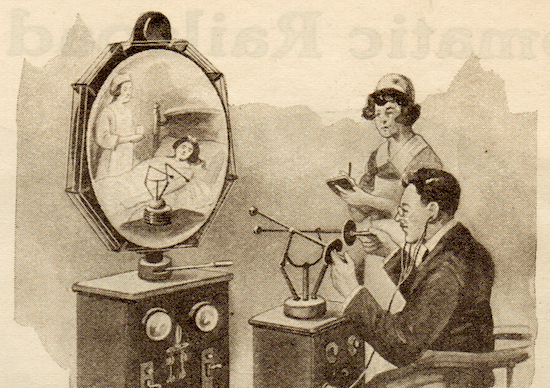 So it is that we are still waiting for the predictions from the 1920s about the future of telemedicine or robotic-assisted surgery to come to pass. When it does, doctors will have to be trained to have good “webside manners” too. The year is 2070 and a rebellious 16 year old gets behind the wheels of a car. And that too after she gets hold of an ancient relic which did have a wheel to get behind. Because all the cars for several years now are fully autonomous and in fact, driving by humans has been outlawed. She does not get far on the highway before she hears the siren of the police vehicle. This idle musing may be thought to be a logical culmination of arguably the first “car” conceived by Leonardo da Vinci in 1495. In fact a wonderful creation of a working model based on this drawing was attempted successfully in 2006 by a team in Florence. Autonomy in cars has been slowly seeping into the mainstream. Though not nearly as fast as prognostications from the mid-20th century. For example, if you were expecting to be playing your favorite family board game as your car whizzed you to your destination, you have already been sorely disappointed. Technology has made its steady, if unspectacular, progress in this field. It has delivered features like cruise control, lane change detection, blind spot detection, and automatic braking. Then came the game changers – deep neural networks (software) and relatively inexpensive and accurate lidar sensors (hardware) – which have given a huge fillip to the dream of fully autonomous (Level 5 automation if you want to geek out) vehicles. This trend follows one other pattern that is often seen in technology emergence – its deployment in specialized niche environments before its adoption for the big messy world. Thus, we have been used to airport trains that ferry us from one terminal to another without a driver in sight. Or coming soon, autonomous tractor combines making our agriculture even more automated. What will make the transition to the fully autonomous vehicles a careful deliberate one (to the circumspect) or a mind-numbingly slow one (to the impatient technology adopter) will be partly technological and partly regulatory. The technology needs to catch up in computer vision, reliability, and security to give us autonomous solutions that are an order of magnitude or more safer than human-driven solutions of today. The regulation needs to catch up to decide who takes the blame when something goes wrong. I remain curious to see which one of the two leads. My bet is on technology staying ahead because I know very many really smart colleagues who are working on the slew of technical challenges. So I think that technological predictions are important to make – they set aspirational goals for technology researchers, industry practitioners, and regulators. Only brave souls and people with a great broad view of the landscape should dare make such predictions though. Any of you out there who would step up and tell me of some technology that will come to be commonplace in 25 years time? Or one that you dearly wish will take that place? Posted in Technically Speaking. Tagged technology predictions, technology promises.